It's time we all stop focusing on the negatives. An excerpt from "The 'PC' Issue"
Generalizations. They’re no good, right? Especially the bad ones. As fiction breeds stock characters with which to weave a narrative, non-fiction news reporting generalizes individual people to exploit for a story. Take me, for example. 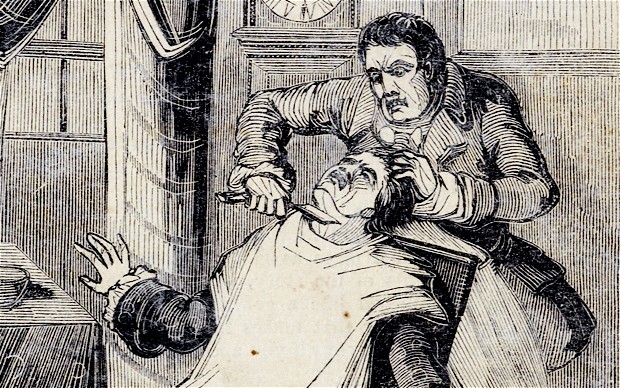 I, Sweeney Todd, the Honest Barber of Fleet Street, provide many goods and services to the people of the good city of London. I perform in public, I give expert shaves and haircuts, and I also help my girlfriend manage a bakery, which produces the freshest, highest quality meat pies around. Yet, the only publicity I get from the papers are barbed and intolerant criticisms. You see, the media is obsessed with labels. “Demon,” “cannibal,” “killer.” Those kind of labels breed hatred and spread mistrust. Although my business partners and I devote endless time and energy to caring for our sweet, sweet friends and neighbors, the instant that one person loses their life, I become “The Demon Barber of Fleet Street.” Why can’t we move beyond these stereotypes? It may be true that I lure unsuspecting people into my barbershop, slit their throats, and slide them down the laundry chute into my girlfriend’s basement. But that’s not all I may or may not do. This dehumanizes me, causes me to lose business, and mostly just makes me feel sad. If, hypothetically, I stopped “killing my customers,” maybe the media would ease off a little bit. But, how would we stay on the cutting edge of the market if I changed this essential tenet of our operation? It comes down to the principle of the thing; no one should be expected to conform to the media’s warped, unrealistic depiction of morality nowadays. So yeah, call me what you will. With this, I, Sweeney Todd, “The Demon Barber of Fleet Street,” challenge the media to just stop noticing if I kill people. All this does is create a culture of negativity and fear, and that has nothing to do with me! What’s the point in telling people about bad things that happen? Life is hard enough as it is, believe me. Let’s just only talk about good things from now on! We can all be better than the media machine. To the members of the media, I challenge you to write an editorial on how crisp and clean my haircuts are, rather than insinuating that I may or may not kill my patrons and bake them into pies. Obviously, no one is completely good or completely evil. Once society moves past this heinous moral binary, we can all work together to end this stereotype that plagues me and my business. Society needs to realize that barbers are people too, no matter what that sinking feeling in your gut tells you. After all, doesn’t everyone deserve to live their life in peace?